It's that time of the year again. I've got that itch to cut my hair. Though, I most likely will not go through with it. You see, every now and then I decide I need a change. My hair has gotten very long recently, to a length I've wanted it to be for years, and it's looking a little tired. The unintentional ombré has grown out and lightened enough that I'm thinking a nice chop would do me well. Backstory: A couple of years ago after experimenting with the summery auburn shades of my youth, I called it quits for the sake of healthier hair and went back to brown. I've since been waiting for it to grow out and as time took it's toll the dye faded and my strands went from chestnut to gold (though the ends have been photographing more on the red side). I got very lucky that it was trendy to have ombré hair but I've never been a fan of it. So why did I stick with a look I wasn't fond of, you ask? I did so much damage to my hair that I don't plan on dying it again until I need to. That and I didn't/don't mind it. It's just not something I would have chosen. Now that the grown out portion is finally at my shoulders, I have the opportunity for a fresh start, if you will, with monotone hair. Or, I can keep it long and keep trimming off the gold bits until it's all gone. Decisions, decisions. 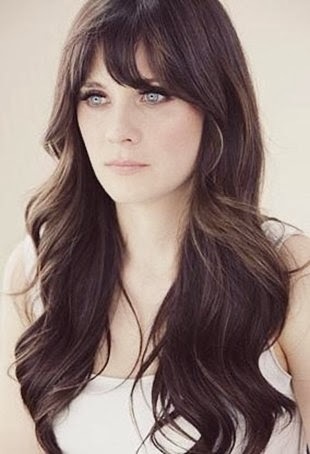 Zooey Deschanel and Amanda Seyfried both have the most beautiful hair and make me want keep my hair long forever. But I love the long bob cut. It's one of my favorite haircuts I've had and the one I always think of when when I want to make a change. It's timeless and flattering and looks lovely on Charlize Theron and Fearne Cotton. I suppose I've got some thinking to do.. What do you think? I am in the same boat! My hair is crazy long right now and while I love it, it needs a change, badly. I have pinned so many 'long bobs' it's not even funny, I just don't know if I can pull the trigger.